If for example, you want to double the vertical height of the canvas in PS, you select Percent, make the Vertical value 200% and the Horizontal value remains at100%. I use this feature all the time and need it in Affinity Photo. Maybe the Affinity Photo Workbook would be a useful companion for you here, in order to get a better overall overview of the software. @v_kyr That's fantastic. Thank you. The more I learn the less I know! Now I need a Displacement MAP that works. I converted my PSD Maps for Water Ripples into png files bot all they create is a bunch of jagged images instead of Water Ripples like they do in PS. The displacement filter correction might be fixed during the APh 1.7.x beta phase, at least I hope so. @v_kyrI made many attempts to make this work. In order for it to work properly, I believe that both the width and height values would have to be changed. For example, the height could be changed to 200% (that part works) but the width would have to be set at 100%. Presently, the program will not allow this. Therefore it is impossible to create a Macro that will work on a variety of different size images. Did you clicked on the lock in the middle to open it and thus unconnect the horizontal and vertical size fields? - Works for me. @v_kyr Yes, thinking that might be the issue, I tried it several times. Maybe it's a PC issue. With the lock unlocked, as soon as I tried to change the second value, the first value reverted back to the original value. Not seeing that here. I tested by unlocking first, changing the first value then the second; both remained as set and the canvas size changed. I then tested by changing the first value, then unlocking, changed second value' both remained as set and the canvas size changed. So not sure why yours does not work this way?? Long-time user of Serif products, chiefly PagePlus and PhotoPlus, but also WebPlus, CraftArtistProfessional and DrawPlus. Delighted to be using Affinity Designer, Photo, and now Publisher. I've tried this both on the Release version and the Beta version without any luck. Next, I'll try a complete removal, download and install. My computer is up to date, plenty of power, 48GB Ram, virus free, Windows 10 Pro and zero problems. I removed Affinity Photo and the Beta version. I went into regedit and removed all the keys that I could find using Affinity Photo as the search. I downloaded a fresh version and installed Affinity Photo. No luck. I uninstalled again, cleared Apdata and again cleared the Registry of anything Affinity Photo. I am at wits end on this. Do you mean probably something like percent to pixel values or the like? - It might recalculate the values into the new initial used size dimension then (aka 100 px will get 200 px etc.). Otherwise a short screenrecording of the behavior for you on Win might show. What has to happen is that I need to set the width of the image Canvas at 100% and the Height of the Image Canvas at 200%. So far, I can't find a way to do that so I can make it into a Macro and apply it to images of different sizes. You probably will not be able to do that with a macro, until Serif reworks the macro facility. Affinity macros tend to record the results of a calculation. So, for example, you could create a macro that unlocked the width and height so they could be separately adjusted, then multiplied the height by 2. Suppose you recorded that macro using an image with a height of 600px. The macro would record that you wanted to change the height to 1200px, rather than recording the "multiply height by 2" action that you wanted to record. There have been some macros created that instead apply a Filter > Distort > Equations in order to resize images using an equation. But that's about all you can do, I think. Yes, sadly macros do statically record sizes here, thus expressions are executes during recording. In other words sizes aren't calculated dynamically during a macro playback instead, which would make them generally usable for different document sizes. Maybe one of you that has lot more influence over the folk at Affinity can get them to clean up and fix the things that are broken before the move forward into something either more exciting or of a minimum value. PS is an excellent place to observe how things are being done and identify the pitfalls associated with how things are working in Affinity now. Of course, it could be that they are happy to keep producing elements that work a little sometimes with the idea that "we will fix it someday". Maybe one of you that has lot more influence over the folk at Affinity can get them to clean up and fix the things that are broken before the move forward into something either more exciting or of a minimum value. Somehow I doubt this, since I've never seen any statement about a concrete rework for the macro functionality here so far. None of us has any more influence than any other of us, I'm afraid. Serif are following the feature requests, and improved macro support is a frequently requested enhancement. But only they know their intentions, their priorities, their resources, and their timeframes. In this case, it isn't just the Macro system that's a problem. Even without trying to create a Macro (record) I can't make the changes to the Canvas Size values and have them stay. At least two people have reported that it was working for them. I've done everything I know to do. I still don't know if it is a PC issue only. On another matter, this Forum, all of them, is a copout on the part of Serif. A lot of great people who know a lot about the programs are, in most cases, doing a great job of solving many of the issues. However, without the input from Serif, there are many things that go unsolved and unexplained. That's unacceptable! Personally, I was really excited to see products on the market that could revolutionize how we do our work. Consequently, I've spent countless hours trying to learn a new product and do things I've been doing for years, but now, I might be able to do them in a better way. I am extremely disappointed in what I have experienced thus far. Thanks again for all your efforts. If nothing else, it's been a fun learning process. Click the center rotation center icon. The result was a canvas that is twice as wide as before, and the original height, with the existing picture centered in it. Tried it out and have the same outcome as the others. @walt.farrell for shorter to demonstrate things you can use ScreenToGif or see on GitHub too (ScreenToGif), it also always offers a portable small footprint version of that (ScreenToGif.2.16.Portable.zip) on Win. - Or use the free edition version of ActivePresenter which offers a lot for annotations and the like. Another small and free one is Monosnap here. @walt.farrell The issue I have is that I want to do the same thing in Affinity Photo that I do in PS. I want to set the width at 100% and the Height at 200%. Entering 200% in the Height box instead of the width box doesn't work for you? It certainly does for me! 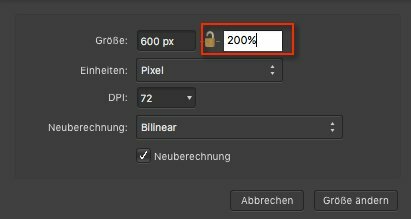 I've just tested it again with no problem: unlocked the aspect ratio, entered "200%" in the height box, clicked "Resize"; instant change to the required canvas dimensions. Well entering 100% into the width text box which shows let's say 600 px wouldn't change anything for the width here, since it will then remain to be the actual size (100% = 600 px, 200% = 1200 px, ...and so on ...).